‘Green’ activists are planning a demonstration at Tate Modern in London this Sunday to protest at the art gallery’s 20-year sponsorship links with BP. The intended sit-in is timed to mark the first anniversary of the explosion on the oil giant’s Deepwater Horizon platform, which killed 11 men and leaked millions of gallons of crude into the Gulf of Mexico. 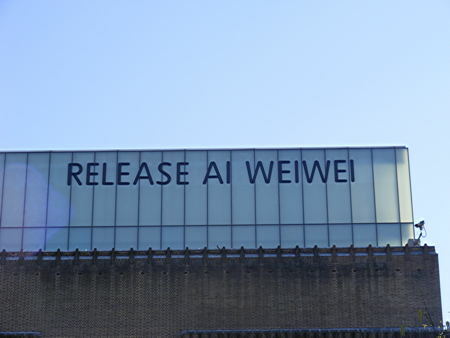 The protestors’ anger would be better directed if they joined cause with Tate Modern to urge the Chinese government to release dissident artist Ai Weiwei, a symbol of the many the Beijing regime have been banging up for questioning its authority. Ai’s Sunflower Seeds installation in Tate Modern’s Turbine Hall provides a focus to remind the world that capitalism may be now shaping China’s economy, but freedom of expression remains suffocated by the country’s ruling Communist Party. In any case, Tates Modern and Britain are right to take BP’s money, as does the British Museum, the Royal Opera House, and the National Portrait Gallery. If the oil company hoped to win respectability by such largesse then it has been sorely mistaken. I’m sure if the same activists were around when Sir Henry Tate was presenting his art collection to the nation, some would reject the offer because the philanthropist’s fortune was based on sugar, which contributes to obesity and heart disease. It hardly makes sense to refuse support for the arts from almost any legal quarter at a time when the Coalition government is wielding the costs axe over our cultural heritage. There will always be something to disapprove of with any patron of the arts – almost by definition. How did they come by so much money they can afford to give it away? Sometimes it backfires as with case of the London School of Economics accepting Colonel Gadhafi’s bungs. But I say take the money and run exhibitions. We’ll see on Sunday, in a democracy people are free to express their displeasure as with the opportunity to expose BP’s ‘crimes’ in the glare of publicity. There is so much info out there about so many issues, that re 'protest', it's 'horses for courses'. BP has a lot of problems in the USA and Russia. There might not be a BP to protest against soon. Speaking now with hindsight, the actual protest in London was more than just the usual suspects as it included people from the USA's Gulf region who had suffered as a result of the disaster. The Chinese government's response to your concerns about Ai Wei Wei, would probably be that socially and politically the individual's rights must be subsumed to the greater good of the progress of the people and the nation state; while we in the West value individual human rights as a value more important than anything else. [But not, I suspect when it comes to the crunch! ].